We checked out of The Signature at noon and had eight hours to amuse ourselves. So... we walked to Luxor Hotel and paid tickets to see the Titanic Exhibition. The highlight of this show is the relics that were collected from the botton of the North Atlantic Ocean over since 1994. This included the "Big Piece" a 15 ton part of the bulkhead that separated during its journey to the bottom in 1912. We were not allowed to take photos inside so the attached photo is inside the pyramid Luxor structure and the entrance to the exhibition. 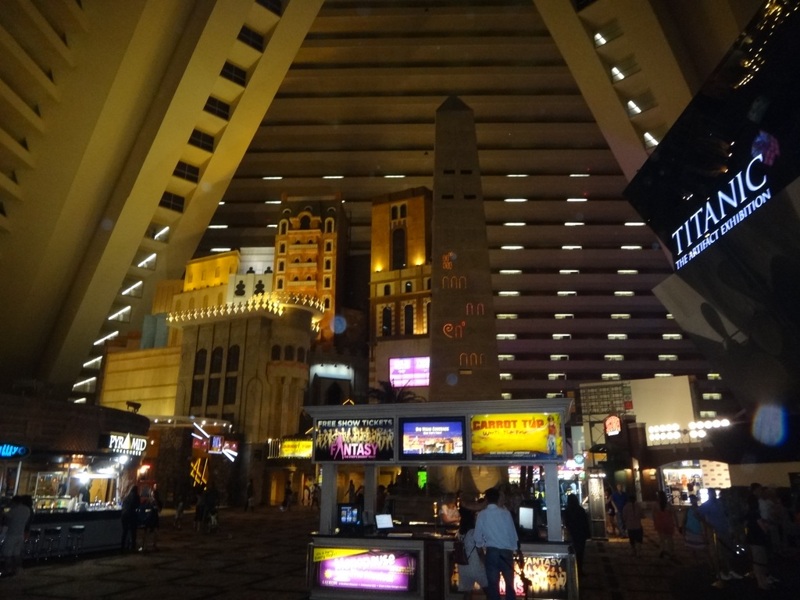 After Luxor we just walked around the shops around MGM Grand and had dinner at an Asian restuarnt before being picked up by shuttle at 8:20pm for the airport. We have gained exit seats for the journey to Washington DC and will be a short nighttime journey for us (4.5 hour flight). That's it for today and until tomorrow cheers.